As we advance towards an automated future with latest trends in digital technologies, human needs and behavioural requirements are getting more apparent with each passing day. People are constantly looking for new updates in technology, which is almost a never-ending process, assuring mobile app development companies that they are going to be around for quite a while. Business-oriented mobile apps have become a necessity as they enhanced productivity, meet customer demands, and also build brand awareness. As per the records, over 250 billion free apps having been downloaded in 2017 alone, which is expected to continue with even more exponential growth rate in 2018. By the end of 2017, it has been quite obvious that mobile application market has been dominated by social media, lifestyle and gaming apps. 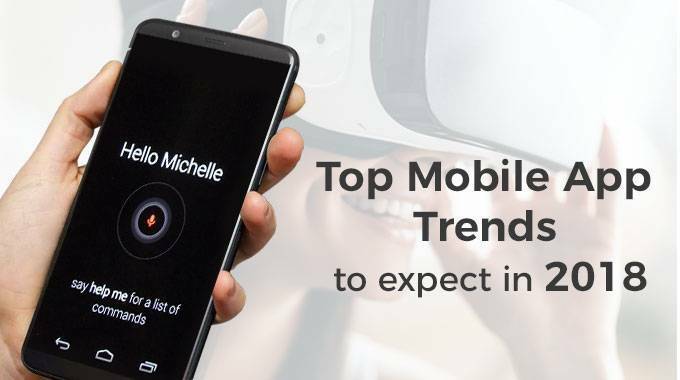 Major companies and enterprises are using mobile applications for branding, increasing customer engagement, direct marketing etc., while small and midsize businesses are also following the mobile trend and utilizing technology in their own way. And this brings us to the realizing the essentiality of keeping up with the trends in order to survive the gruesome competition in app development. Enough said; for those who already can’t wait for 2018 to start in the best interests of digital technology, here’s a list of top trending mobile app developments we can expect to change the course of the world in the upcoming year. Artificial Intelligence is going to own 2018 in terms of technology, as many components of technology sector have already buckled themselves up with artificial intelligence integration. From what the figures say, AI market is expected to grow more than $50 billion by the end of 2018. Many app development companies are implementing AI features in their apps to attract users. In the recent times, there has been a huge demand for IoT service providers, in every sector ranging from healthcare to education, smart homes to smart offices. IoT apps have partly joined the mainstream application, and shall hopefully be ready to show us some of the most incredible aspects we could not have imagined otherwise. Augmented Reality is the product of real world fused with virtual reality. In 2017 AR and VR reached beyond entertainment and gaming. The AR tools can be used in a productive way in different sectors such as retail shopping, hotels, schools etc. There are many apps developed with Augmented Reality and one of the best such specimens is Pokémon Go. Mobile app security got introduced with new dimensions in security in 2017, with biggest mobile app like WhatsApp adopting and improving their security provisions, like End-to-End Encryption, AI Integration for smart user information handling and Blockchain technology integrated apps for decentralized technologies handling user information data with Smart Contracts and much more. Google has introduced the AMP to increase the loading speed of web pages on mobile device which can reduce the bounce rate of the website. AMP has benefitted mobile app developers, marketers, publishers and owners with great visibility on search engine result pages (SERP). AMP is expected to be one of the important mobile app development trends in 2018. Cloud technology is something that every app should be incorporated with. Mobile App Developers are designing more cloud driven mobile apps to make quicker and easier to get data without impacting internal phone memory. According to the Cisco VNI Global Mobile Forecast (2015-2020), cloud apps will drive 90% of total mobile data traffic by 2019 globally. Many apps development companies are looking to include Chatbots in their apps to do things like buying online stuff, organizing daily tasks, and book tickets etc. Already apps like Google’s Allo or Microsoft’s Azure Bot are in the market. Tech giant is investing thousands of dollars into creating Chatbots. The above mobile app development trends are already used by best mobile app development companies and expecting to leave a strong impact in 2018. It is becoming tougher day by day with the ever changing demand of users, so new inventions are happening in order to reach user expectations. With huge advancements in mobile app development, we can expect the next generation mobile apps to make our lives much easier.